Last week the "storm of a century" was predicted to hit Richmond, Virginia. Thus hubby decided that instead of waiting until after Christmas to take the family, his parents, and his cousin up to Washington, D.C., he'd take us before Christmas. Lemme say I hate DC traffic because it's one of the cities where rude, think-only-about-yourself driving is a necessity. Fortunately, I wasn't driving. However, instead of being in Old Reliable (my black surburban), we were in a golf-cart mini-van (GCMV) rental because...well, that's another blog post. GCMV had air-bags approximately spaced 36 inches apart all around the inside of the vehicle. Didn't make me feel any more safe. Okay, so after visiting the Lincoln Memorial (three of five kids needed to potty and the LM has clean bathrooms), we headed on over to the Smithsonian Institute National Museum of American History but had to pass Natural History Museum first. But for some reason we did a loop and were next to the Air and Space Museum. Or maybe we looped before visiting the Lincoln Memorial. Hmm. Anyhoo, my kids immediately began squealing, "That's in A Night at the Museum, Part 2!" I then pointed to the large glass window and said, "And that, kids, is the window Amelia Earhart flew her plane through." I like museums. Thus I knew one of my mother-jobs was to instill a love (or at least appreciation) for museums in my kids. 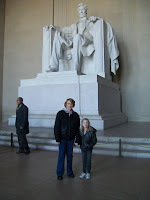 Which was why we visited the American History one. Again. Sometime earlier this year, over at Seekerville, someone posted about museums and Mary Connealy mentioned how she liked taking pictures of the plaques that told about an item or whatnot. Well, let's just say more than once during our visit to the American History museum I said, "Jerah, where's your brother? I need his phone to take a picture." Through its newest exhibition, “Within These Walls…,” the Smithsonian’s National Museum of American History will showcase 200 years of American history as seen from the doorstep of one house that stood from Colonial days through the mid-1960s in Ipswich, Mass. The largest artifact in the museum, the Georgian-style, 2 ½ - story timber-framed house was built in the 1760s, just 30 miles north of Boston and stood at 16 Elm Street until 1963. Museum visitors can peer through its walls, windows and doors to view settings played out against the backdrop of Colonial America, the American Revolution, the abolitionist movement, the industrial era and World War II. What fascinated me the most in the museum wasn't the Choate House exhibit. Toward the end of our tour, we visited the Inventors exhibit. Did you know a WOMAN invented Kevlar? I didn't. Stephanie Kwolek spearheaded polymer research at DuPont's Pioneering Lab until her retirement, as Research Associate, in 1986. She is recipient or co-recipient of 17 US patents, including one for the spinning method that made commercial aramid fibers feasible, and 5 for the prototype from which Kevlar® was created. Kwolek continues to consult part-time for DuPont, where she is also known and respected as a mentor to young scientists---especially women. Kevlar® (first marketed in 1971) is a fiber five times stronger once for ounce than steel, but about half the density of fiberglass. Kevlar® is best known to the public as the material from the which bulletproof vests are made; and in this use alone Stephanie Kwolek's discovery has saved thousands of lives. In fact, Kevlar® has dozens of important applications, including radial tires and brake pads (a replacement for asbestos), racing sails, fiberoptic cable, water-, air- and spacecraft shells, and mooring and suspension bridge cables. It is now used to make skis, safety helmets, and hiking and camping gear. In commercial terms, Kevlar® generates sales of hundreds of millions of dollars per year worldwide. 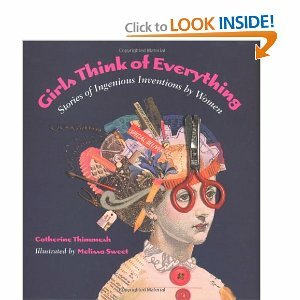 Far too often we think "men" = "inventors." But women have made a huge impact in advancements in our culture. Know of one? Ever visited one of the Smithsonian Institute's (the world's largest museum and research complex, with 19 museums, 9 research centers and more than 140 affiliate museums around the world) museums? If so, what's your favorite one and why? I'm still trying to figure out why, since the Hope Diamond belongs to the American Public and I'm a member of the American Public, can't I borrow the necklace sometime. I'll give it back. Promise. I love the Smithsonian but I could never choose my favorite. I hope everyone gets to visit at some time. I haven't seen the second "night" movie set there--sounds like a hoot. What's also great is the quality of the short term exhibits. They make return trips well worth it. I was told once that you can make special appointments to see something not currently on display because they only show about a tenth of what they own. That's what I recall but I can't verify so don't quote me. Okay I lied My favorite is the American history museum. What was I thinking? I have great memories of the Smithsonian as a child. The huge elephant/wooly mammoth? in the rotunda of the Natural History Museum stands out for me. I took my kids to the Lincoln Memorial a few years ago. They have marked the step where MLK Jr. stood to give his I Have a Dream speech. It was pretty cool to stand on that spot and look out over the reflection pool. No fair putting up books I'd like to own. I cant buy more books until we are in a more permanent location than where we are now. And thank you for turning off the music on load. I couldn't read anything. A few years ago a friend and I happened to be wandering the Nat. History museum while they had an exhibit about women of the Appalachians. It was so well done and so compelling, we kept getting teary eyed. The black and white photos and stories were quite inspiring. A dog museum? that sounds interesting. I have a couple here I'd be willing to send over. Dogs that is...THEY'RE DRIVING ME CRAZY. Have a great new year, Cheryl!